Puzzle Word is one of the rare games that are simple to play but really do take a lifetime to master. 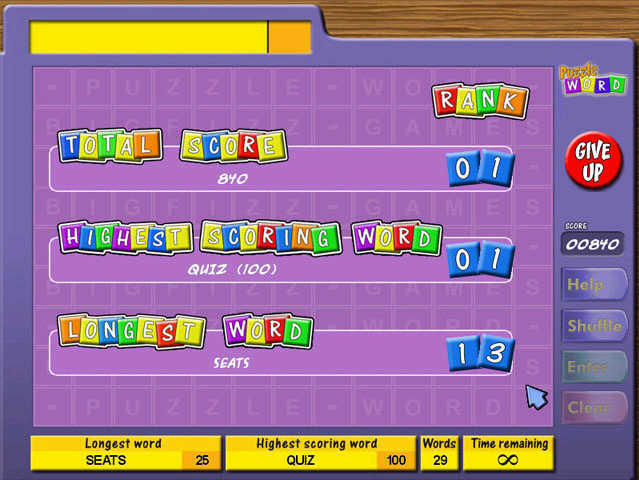 Word Puzzle Game - Puzzle Word is one of those rare games that is simple to play but takes a lifetime to master. Make words of 3 or more characters. After you make a word, those blocks will disappear and the blocks above will fall into the spaces. As you progress you'll find yourself begin to really strategize to assemble the blocks to make coherent matches. Millions of possible level permutations mean the challenge is virtually limitless. Download one of our most Addictive games today! COMMENTS: This is one of those games that just looks SOO simple, yet after about 30 minutes of play, I literally cannot stop playing! Maybe simpler is better? Overall, if the game had much more spectacular effects, I might give it a perfect score. It is plenty good as it is though. Flip Words - A word game make words and solve phrases! Word Wizard Deluxe Game - The ultimate word challenge with enough depth and variety of play to keep you entertained for a lifetime. Word Search Deluxe - A truly amazing version of Word Search Deluxe Game of the most popular word games ever invented. WordLab - A challenging puzzle word game that will change the way you word spell FUN! Marbles Shooter - Combines the best qualities of arcade games and puzzles ! Marbles Deluxe - It is our only puzzle game. Why? Because most puzzlers are all the same, but not Marbles Deluxe.